KUWAIT CITY/CAIRO, Oct 15, (Agencies): His Highness the Amir Sheikh Sabah Al-Ahmad Al-Jaber Al-Sabah sent a cable of condolence to Egyptian President Abdel-Fattah el-Sisi over the victims of the “terrorist” attack that targeted a security checkpoint in North Sinai Governorate. His Highness the Amir expressed Kuwait’s strongest condemnation to such heinous terror acts that attempt to create insecurity and instability in the region. His Highness the Crown Prince Sheikh Nawaf Al-Ahmad Al-Jaber Al-Sabah and His Highness the Prime Minister Sheikh Jaber Al- Mubarak Al-Hamad Al-Sabah sent cables of similar sentiment. 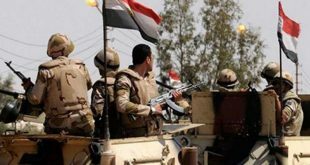 Yesterday, some fifteen militants and 12 military personnel were killed in clashes in Egypt’s North Sinai Governorate at a security checkpoint. Other six army personnel and a number of militants were also injured. President el-Sisi said in comments published on Saturday that his country’s war against Islamic militants in the Sinai Peninsula would be long, but that conditions in the vast and arid region were improving. In an interview with Egypt’s three state-owned newspapers, he acknowledged that both the militants and government forces were getting better at fighting each other in the strategic area bordering Israel and the Hamas-ruled Gaza Strip. “Conditions in Sinai are improving and (our) efforts are continuing because the war is long,” said el-Sisi, whose comments came one day after Islamic State militants attacked an army checkpoint in Sinai, killing 12 soldiers and wounding at least six more. “The terrorists are evolving and we are improving our operations,” he said. IS claimed responsibility for the attack in a statement Saturday, saying its fighters killed 20 “apostates” and seized all weapons at the checkpoint, located about 80 kilometers (50 miles) east of the Suez Canal, near the town of Bir el-Abd. The Egyptian military said Friday that troops killed 15 militants in a gun battle at the checkpoint. The IS statement said its fighters had “returned safely” to their base. Journalists have had virtually no access to northern Sinai in recent years. On Saturday, security and medical officials said a member of the security forces was killed when suspected militants attacked a checkpoint near the town of Sheikh Zuweid in northern Sinai. They said the attackers fled after the checkpoint’s force returned fire. The officials spoke on condition of anonymity because they were not authorized to brief the media. Egypt’s military launched air strikes against jihadist targets in the Sinai Peninsula on Saturday, the army said, after the Islamic State group killed 12 soldiers at a checkpoint. The northern Sinai is a stronghold of the Sunni extremists, who have killed hundreds of soldiers and police since the military overthrew Islamist president Mohamed Morsi in 2013. Friday’s attack saw mortar rounds and rockets fired at an army post west of El-Arish, the provincial capital of North Sinai, according to officials. The military said in a televised statement that its aircraft had taken off at dawn on Saturday for a reconnaissance and bombing mission that lasted several hours and was still ongoing. It said the strikes targeted hideouts of armed extremists involved in Friday’s assault, adding that a number of the jihadists were killed and weapons destroyed.